The constitution of Brahman is immortality, imperishability, eternity, and happiness. Brahman is the beginning of transcendental realization. Paramatma, the Supersoul, is the middle, the second stage in transcendental realization, and the Supreme Personality of Godhead is the ultimate realization of the Absolute Truth. Therefore, both Paramatma and the impersonal Brahman are within the Supreme Person. It is explained in the Seventh Chapter that material nature is the manifestation of the inferior energy of the Supreme Lord. The Lord impregnates the inferior, material nature with fragments of the superior nature, and that is the spiritual touch in the material nature. When a living entity conditioned by this material nature begins the cultivation of spiritual knowledge, he elevates himself from the position of material existence and gradually rises up to the Brahman conception of the Supreme. This attainment of the Brahman conception of life is the first stage in self-realization. At this stage the Brahman-realized person is transcendental to the material position, but he is not actually perfect in Brahman realization. If he wants, he can continue to stay in the Brahman position and then gradually rise up to Paramatma realization and then to the realization of the Supreme Personality of Godhead. There are many examples of this in Vedic literature. The four Kumaras were situated first in the impersonal Brahman conception of truth, but then they gradually rose to the platform of devotional service. One who cannot elevate himself beyond the impersonal conception of Brahman runs the risk of falling down. 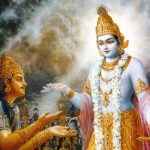 In Srimad-Bhagavatam it is stated that although a person may rise to the stage of impersonal Brahman, without going further, with no information of the Supreme Person, his intelligence is not perfectly clear. Therefore, in spite of being raised to the Brahman platform, there is the chance of falling down if one is not engaged in the devotional service of the Lord. In the Vedic language it is also said, raso vai sah, rasam hy evayam labdhvanandi bhavati: “When one understands the Personality of Godhead, the reservoir of pleasure, Krishna, he actually becomes transcendentally blissful.” (Taittiriya Upanishad 2.7.1) The Supreme Lord is full in six opulences, and when a devotee approaches Him there is an exchange of these six opulences. The servant of the king enjoys on an almost equal level with the king. And so eternal happiness, imperishable happiness, and eternal life accompany devotional service. Therefore, realization of Brahman, or eternity, or imperishability, is included in devotional service. This is already possessed by a person who is engaged in devotional service. The living entity, although Brahman by nature, has the desire to lord it over the material world, and due to this he falls down. In his constitutional position, a living entity is above the three modes of material nature, but association with material nature entangles him in the different modes of material nature—goodness, passion and ignorance. Due to the association of these three modes, his desire to dominate the material world is there. By engagement in devotional service in full Krishna consciousness, he is immediately situated in the transcendental position, and his unlawful desire to control material nature is removed. Therefore the process of devotional service, beginning with hearing, chanting, remembering—the prescribed nine methods for realizing devotional service—should be practiced in the association of devotees. Gradually, by such association, by the influence of the spiritual master, one’s material desire to dominate is removed, and one becomes firmly situated in the Lord’s transcendental loving service. This method is prescribed from the twenty-second to the last verse of this chapter. Devotional service to the Lord is very simple: one should always engage in the service of the Lord, should eat the remnants of foodstuffs offered to the Deity, smell the flowers offered to the lotus feet of the Lord, see the places where the Lord had His transcendental pastimes, read of the different activities of the Lord, His reciprocation of love with His devotees, chant always the transcendental vibration Hare Krishna, Hare Krishna, Krishna Krishna, Hare Hare/ Hare Rama, Hare Rama, Rama Rama, Hare Hare, and observe the fasting days commemorating the appearances and disappearances of the Lord and His devotees. By following such a process one becomes completely detached from all material activities. One who can thus situate himself in the brahmajyoti or the different varieties of the Brahman conception is equal to the Supreme Personality of Godhead in quality. Sridhara Svami gives the following meaning of the verse: “I am the basis of Brahman” means “I am the condensed brahman,” just as the sun globe is condensed light. Just as the sun, though being the form of light, is also acts as the basis of light, so I, Krsna, am the form of brahman, but I am also the basis of brahman. The Lord, one person, Vasudeva is situated in prakrti, the jlva and the brahman. The paramatma is superior to the existence of brahman, just as you, Acyuta, are superior to all others. That supreme brahman illuminates the whole universe. You should know that the condensed light belongs to me. I offer my respects to the son of Nanda, joy personified, the very essence of all beauty in human form, the supreme brahman, devoid of dualities of the mind. 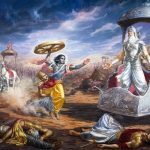 This chapter explains the misfortune in being bound by the gunas and the satisfaction in being free of the gunas, which is produced by bhakti alone. 14.27 The term ‘hi’ (for) denotes cause. I, who am to be served by unswerving Bhakti Yoga, am ‘the ground of the individual self, immortal and immutable, and also of eternal Dharma,’ namely, surpassing eternal prosperity and also perfect felicity, i.e., of the felicity attained by the Jnanin stated in texts such as ‘Realising that Vasudeva is all’ (7.19). I, being of such nature, devotion to Me helps the Jiva to transcend the Gunas. 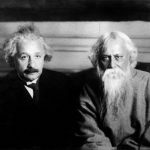 Although the expression ‘eternal Dharma’ is indicative of the conduct to be observed, in the given context, it means the goal to be attained; for, what follows and what precedes it, denote the goal and not conduct. The purport is this: It has been stated that seeking refuge with the Lord is the only means for transcending the Gunas and the attainment of self-realisation, prosperity and the Supreme Being in the earlier text beginning with, ‘For this divine Maya of Mine consisting of the three Gunas is hard to break through, except for those who take refuge in Me alone …’ (7.14). Thus, seeking surrender to the Lord with one-pointed mind is the only means for transcending the Gunas and for the attainment of the state of brahman through that. [Here Prapatti, surrender to the Lord, is mentioned as a limb of unswerving Bhakti Yoga according to some interpreters. This is however a disputable point, as some maintain that Prapatti is in itself an independent path]. Here the reason is revealed by Lord Krishna for what He proclaimed in the previous verse. That He, Himself is the pratistha or source of the brahman in concentrated form. In the same way the sun is concentrated light. Likewise He is imperishable, immortal and eternal. He is dharma or the eternal religious principles which are the means to moksa or liberation from material existence and freedom from samsara the perpetual cycle of birth and death. The Supreme Lord Krishna is the ultimate embodiment of pure, absolute, transcendental ananda or bliss. As His devotees only desire association with Him, they inevitably attain His nature and association with Him. So in conclusion the Supreme Lord Krishna has declared that the ocean of samsara results from the three gunas or modes of material nature which are all subservient to Him. The ocean referred to is in the form of the 43,200,000 or 43 million and 200 thousand lifetimes in one day of Brahma that all all jivas or embodied beings who have not achieved moksa are subjected to before partial dissolution of creation dissolves them back into pradhana or the cosmic absolute. 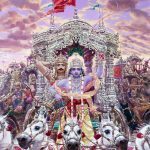 In this chapter the Supreme Lord Himself has confirmed that His devotees easily cross over this ocean due to their exclöuisve devotion unto Him. In this verse the brahman or spiritual substrtatum pervading all existence refers to Sri Laxsmi, the goddess of fortune. This is what is being clarified by the words brahmano hi. As one attains Sri Laxsmi one attains the Supreme Lord as she is never separated from Him. So by her grace one attains the immortal, eternal, imperishable state of the Lord Krishna. The word aikantikanye means the ultimate and denotes the happiness one experiences in communion with the Supreme Lord. Thus the manner of attaining Him has been explained. Lord Krishna now gives the evidence why bhakti yoga or exclusive loving devotion to Him is the panacea for transcending the three gunas or modes of material nature and qualify to become elligible for the state of the brahman or spiritual substratum pervading all existence and attain Him. It is because He is the abode of the brahman which is the effulgence of His inconceivable spiritual form and which is a manifestation of His attributes such as being eternal, imperishable, immortal with attributes characterised by moksa or liberation, ananda or never ending bliss and omniscience. Because the Supreme Lord possesses all these, His devotees who worship Him attaining Him easily transcend the three gunas. In conclusion the jiva or embodied being by attraction of the senses to the gunas becomes emershed and entrapped in samsara the perpetual cycle of birth and death. By engaging in bhakti yoga one is released from samsara and awarded moksa or freedom from material existence. In this chapter Lord Krishna the bestower of benevolence onto His devotees, out of compassion instructed the science of transcending the three modes of material nature. 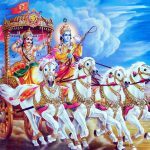 14.27 Hi, for; aham, I, the inmost Self; am the pratistha brahmanah, Abode-that in which something abides is pratistha-of Brahman which is the supreme Self. Of Brahman of what kind? Amrtasya, of that which is indestructible; avyayasya, of that which is immutable; and sasvatasya, of that which is eternal; dharmasya, of that which is the Dharma, realizable through the Yoga of Jnana which is called dharma (virtue); and aikantikasya sukhasya, of that which is the absolute, unfailing Bliss by nature. Since the inmost Self is the abode of the supreme Self-which by nature is immortal etc.-, therefore, through perfect Knowledge it (the former) is realized with certainty to be the supreme Self. This has been stated in, ‘he qualifies for becoming Brahman’. The purport is this: Indeed, that power of God through which Brahman sets out, comes forth, for the purpose of favouring the devotees, etc., that power which is Brahman Itself, am I. For, a power and the possesser of that power are non-different. Or, brahman means the conditioned Brahman, since It (too,) is referred to by that word. ‘Of that Brahman, I Myself, the unconditioned Brahman-and none else-am the Abode.’ (The abode of Brahman) of what qualities? Of that which is immortal; of that which has the quality of deathlessness; of that which is immutable; so also, of that which is the eternal; which is the dharma having the characteristics of steadfastness in Knowledge; of that which is the absolute, unquestionably certain Bliss born of that (steadfastness);-‘I am the Abode’ is understood. 14.27 Brahmanah etc. It is ‘I’ who is the support of the Brhaman. [For], one becomes the [very] Brahman, if ‘I’ is served [by him]. Otherwise if the Brahman is contemplated on – because Its nature is like that of the insentient (i.e., simply a being)-then it leads him (the seeker) to an emancipation which would simply be undistinguished from the deep sleep stage. brahmaṇaḥ — of the impersonal brahma-jyotir; hi — certainly; pratiṣṭhā — the rest; aham — I am; amṛtasya — of the immortal; avyayasya — of the imperishable; ca — also; śāśvatasya — of the eternal; ca — and; dharmasya — of the constitutional position; sukhasya — of happiness; aikāntikasya — ultimate; ca — also.